As more brownfield sites are redeveloped to make way for new housing and commercial estates, developers need to transport drinking water through land previously used for industrial activities where high levels of contaminants are common. This land must either be remediated to reduce contamination to acceptable levels, or an appropriate barrier pipe system installed to provide protection against contaminants and ensure the long-term safety and quality of the water supply. Barrier pipe contain an aluminium layer to protect drink water from pollution. At Civils and Lintels we offer a wide range of polyethylene barrier pipe from leading suppliers including Polypipe and Glynwed Pipe Systems. Our range of barrier includes pipes, accessories, compression and mechanical fittings from the Polyguard and Protecta line systems. 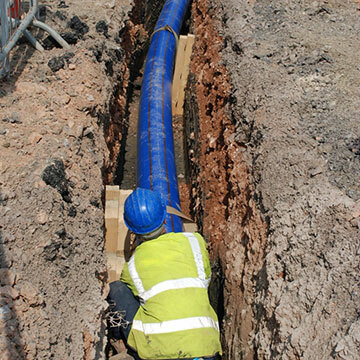 Polypipe’s Polyguard – Polyguard is a pipe and fittings system designed to transport and maintain clean drinkable water through contaminated brownfield land. With WRAS and DWI approval the system provides total peace of mind to the highest industry standards including WIS4-32-19, meeting safety legislation demanded by water companies and customers. 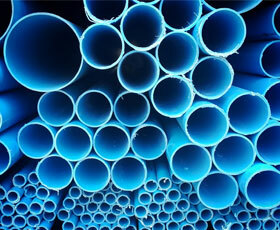 The system is currently offered in pipe diameters of 25mm, 32mm and 63mm available in both coils and straight lengths. A full range of mechanical compression fittings and protecat-line fittings that require no scraping are available. GPS Protecta Line – Protecta line pipe is manufactured with a tough multi-layer, ensuring that that any contaminants remaining in brownfield sites and former industrial land cannot permeate into the water supply. Protecta line pipes incorporate an impermeable aluminium barrier layer wrapped onto a central core of PE80 or Excel (PE100) pipe. This prevents the ingress that could potentially be caused by through wall permeation of hydrocarbons, and related chemicals, that could be present in contaminated land. To ensure a fully integrated system is installed, an extensive range of dedicated, approved Protecta-Line Mechanical Compression, Mechanical, Electrofusion, Ferrule and Pupped fittings are available.